Successfully Added iPhone and iPod Wireless Charging Mat + Leather Case Holder to your Shopping Cart. Bringing you the latest iPhone accessory that charges your iPhone and iPod using wireless technology! This elegant wireless charging mat works together with the included leather iPhone and iPod case/holder; this makes charging your iPhone and iPod a piece of cake. Picture this? When you get home after a hard days' work, just throw your iPhone onto the charging mat, and let it sit there and re-charge. The charging mate is ergonomically designed to suite any home or office decor. You can place this wireless iPhone charger either on your desk, coffee table, side table, night stand, even on the table by your front door where you normally keep the house keys. 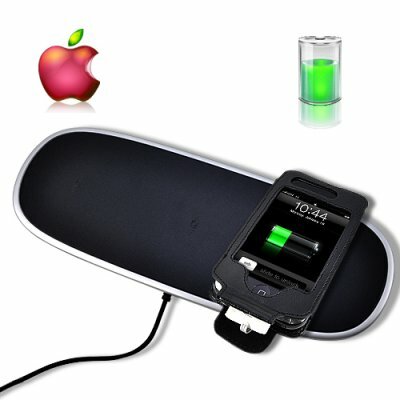 This wireless charging mat also consists of a USB port, which means you can charge other electronic devices such MP4 and MP6 media players, as well as other mobile phones such Blackberry, Nokia, Motorola, Google Android, and any other electronic device that can be charged via a simple USB connection. Another great wholesale gadget from Chinavasion. Don't delay, this sweet iPhone wireless charger will you make you some serious profit. Offer your gadget loving customers a great deal on a great product, by listing this wireless iPhone charger on your drop ship website or eBay listing page. You can even purchase a sample for your physical retail store and later import in bulk with better savings on wholesale discounts. Wireless recharging is now an affordable option for everyone. If you are a gadget person or an iPhone lover, then search no further, because you are now one step from having this super cool iPhone gadget right in your hands. Click "Add to Cart" now, and we'll express ship you a sample straight away. Charges an array of mobile phones like Motorola, LG, Nokia, Samsung, Google Android etc. When you get home at the end of the day, just throw you iPhone on the charging mat, and let it charge, No worries! Your iPhone will charge in the same amount of time it takes to charge up your iPhone traditionally through a wall socket adapter. Can the included iPhone case be used as a regular case holder for my iPhone? Yes, the included leather iPhone case holder is designed to be used as a regular iPhone and iPod case. How does the wireless charger work? The wireless mat charger works by utilizing the principle of magnetic induction on to the iPhone case, it will then safely and effectively provide power to your iPhone or iPod via the 30 PIN connector on the iPhone case. Is is possible to charge multiple devices simultaneously? E.g, can I charge my iPhone while I my Nintendo DS is still charging? Yes, you can charge your iPhone and other electronic devices simultaneously. Is it safe to charge my iPhone using the leather case with the magnetics plate? Of course, it is perfectly safe. This is not a normal magnet, it is designed specifically for this purpose. Chinavasion QC department (Quality Control) checks all products before going online, and before being shipped to our customers world wide.